I Know What Girls Like: Science, Technology, Engineering and Math! Myth: Girls Don't like Math and Science. So why, despite the fact that women are the majority of college graduates today (57%) and hold the majority of master's level degrees (60%), and represent almost half America's workforce (48%), are women still underrepresented in STEM fields? For example, women account for only 20% of the bachelor's degrees in engineering, computer science, and physics and only 25% of STEM positions are held by women. Why are we losing women from the growing STEM jobs that are increasing at 3 times the rate of other jobs in the American economy and so needed for America to keep competitive with other nations in creating a better future? Elizabeth English, Head of School at The Archer School for Girls (grades 6-12 in Los Angeles) spoke out at a taping of the new STEM TV show FabLab on the school's beautiful campus filled with enthusiastic young women (39% of the girls are students of color, coming from 86 zip codes around Los Angeles) taking part in filmed experiments. "We know that STEM is the fastest-growing professional sector with the highest paying jobs. We also know that these fields hold the key to solving some of our world's most pressing problems, and as such demand a plurality of perspectives. Archer is proud to stand at the forefront of advancing girls in STEM and to be working toward a future where women are not only contributors to STEM solutions but leaders in the field." Ms. English argues that we must reach girls by breaking down both the myths about girls' abilities and the stereotypes about STEM jobs, encouraging girls to see STEM careers as creative outlets for improving the world. Mayim Bialik, former child actor (The Big Bang Theory) turned Neuroscientist with seven years of education from UCLA, spoke warmly about her love of science and problem solving. Bialik will be hosting a weekly Q & A segment through FabLab, allowing kids across the country to send her questions about science and technology. Bialik's work as a neuroscientist has focused on neurochemicals involved in Obsessive Compulsive Disorder. 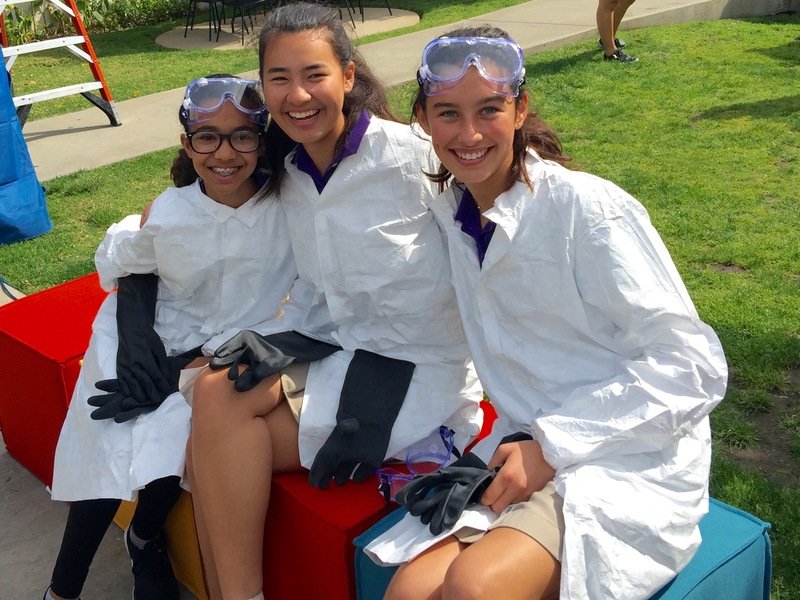 "Getting girls involved in science is a personal passion of mine. I hope to get young women excited about getting into the field I love so much." As I sat watching the enthusiastic young women racing about, joyously engaged in learning opportunities with the hosts of FabLab, I had flashbacks to my own youth. I was lucky to attend a girls' school in Nashville where I became a confident learner, well prepared for my college experience at Vanderbilt and for Law School at Tulane University. But despite the fact that my parents are both neuroscientists who met at Duke in the psychology department, I never entertained a career in science. This was not at all for lack of interest. In fact I loved to read natural history books my father gave me, like Stephen Jay Gould of Harvard who made the natural world so exciting. My high school chemistry teacher suggested that I apply for a National Science Foundation summer program, and I spent a glorious summer studying Marine Science at Florida State University with other high school students from around the nation, equally distributed between boys and girls. I started off at Vanderbilt taking math and science. I particularly loved my biology class. But why did I major in English and Fine Arts despite my continuing interest in Science? I gave up because the math was challenging for me. I didn't see how it applied to anything in my world. I finally took Calculus in the summer with about 7 other people and managed to get a C. I stuck with the courses that were easy for me, relying on my strengths in reading and writing. I forged a career as an environmental lawyer to unite my verbal strengths with my passion for science. But the girls from Archer won't stop taking math and science in college for the reasons I did. They are learning math and science in new ways that show them real world applications for what they are learning. The Archer teachers encourage their students to keep at it, to keep asking questions until they get an answer so that they never miss a concept. Recently, I had a STEAM (same as STEM but with addition of the Arts) salon at my home to support the teaching of creative arts and science in public schools. Astrophysicist Michelle Thaller spoke to us about the beginnings of the universe and how we are all connected to that time and to each other as the very elements that make up our bodies come from the chemical reactions that made the universe. Every atom in our bodies was fused in an ancient star. Despite the appearance of velvet ropes and red carpets in Hollywood to separate the crowd from the celebrities, as it turns out, we are all stars, or the remains of them. I told Michelle about my struggles with math in college and she told me that she had a similar problem and took calculus 3 times!!! She told me that she knew it was a hurdle she had to pass, but that after she did, it was all about her passion for stars and everything was interesting and inviting to her. Thankfully, Michelle is a spokeperson for NASA and shares her message of perseverance with young women all around the nation. She told those assembled at my home that the stereotype of the old, white, anti-social man as the standard bearer for science is just an unfortunate result of our culture choosing who got to do science and has nothing at all to do with the interests of science. Michelle says science is about asking questions and the more kinds of people who ask, the better the chances we get good answers. Michelle also likes to show that scientists don't have to be boring or lack humor. She has her own version of dancing with the stars as she is an accomplished Renaissance dancer and has danced in many observatories around the globe as featured here in the Secret Lives of Scientists. So Go For it, Girls!!! You are Stars! It's your world, and you can make it better with your brilliance!